Home All Topics	When will I be able to play again? When will I be able to play again? The querent is passionate about playing the guitar and has injured his forearm due to overexertion and cannot play now. He’s rather distressed and worried that it may be too long before he can go back to playing again. Although the injury is not deemed serious by his physical therapist he worries because he has a history of arm injuries and has had long periods of down time in the past. Guitar playing is his hobby, not his job, so this is not about his house 10 but house 5, and possibly house 3 as well, since house 3 is the arm. Pluto on the ascendant confirms the querent is afflicted. Fixed stars are descriptive and are like sign posts pointing at relevant planets and/or house cusps: Algol on the 5th cusp shows him rather distressed about his house 5, which is the case. The chart shows the picture of his state of mind. 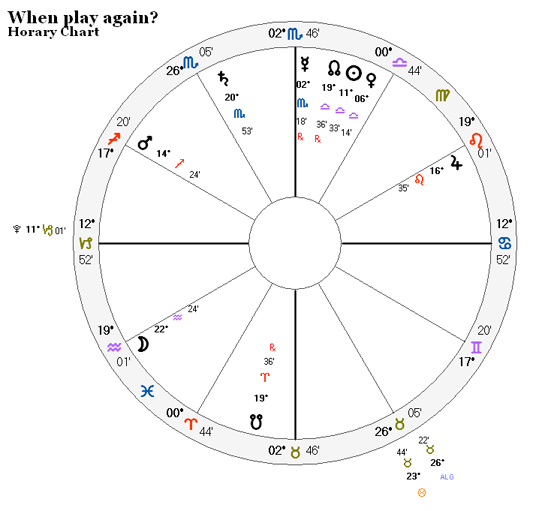 Although this is not relevant to answering the question I find it useful and interesting to see how horary charts indeed show the various elements of the context. If you had a doubt whether this is a house 5 matter Algol would be a clue (so would Fortuna, BTW). An “injury” is a house 6 matter. Mercury (L6) is angular and in the detriment of Venus, L5. Translation: injury upsets his playing/hobby. What is happening while Mercury is in that condition? He cannot play. Will he be able to play when Mercury is no longer in that condition? Barring other negative testimonies, yes he will play again when L6 stops upsetting his L5. What happens to Mercury next? It leaves Scorpio and therefore leaves the angle and leaves the bad reception with Venus; that is what we want. In 2 1/2 time units, give or take, since Mercury is a little slow, adding a little delay. >>> But Mercury is retrograde! Is that not important? >>> No importance beyond pointing at which direction Mercury is going, in this case. “Days” is too short a time frame; “years” too long. We have weeks and months as viable options. How to choose correctly? Mercury is angular in a fixed sign. According to John Frawley’s technique this gives us the longer time unit: months. However, if there is “will” involved then a long time frame becomes shorter. Is there will involved? I concluded that yes, there is. He can take care of himself and treat the arm contributing to the healing process. Let’s look around the chart to see whether anything corroborates that. Mars, his arm (L3), is in house 12, describing the situation: he hurt *himself*. It is applying to a trine with Jupiter, L12. There is the danger of re-injury. L12 is in house 8, accidentally weak. Not a big danger. Saturn is either angular or in house 11, take your pick; either way it is accidentally stronger than L12. So, yes, his “will”, and power to act compared to L12’s, are justified. So the time frame is weeks, not months. Therefore the timing is about 2.5 weeks. With the warning that he must be careful because his arm is still weak (notice the South Node in house 3). He started playing 18 days after the chart was cast, and has not stopped. Note: Mars gaining dignity (exalted in Capricorn) in 15+ time units, plus being mutable (timing for planets in mutable signs create delay, according to JF’s technique), confirms the timing in “days”. But Mars alone does not give us a conclusive time unit, we need Mercury for that. Will there be a major ebola epidemic in the USA?